LSISAS2208 Dual-Core RAID on Chip (ROC). Up to 240 SATA and/or SAS devices. Cache Protection. Extensive support includes Microsoft® Windows® Vista/2008/Server 2003/2000/XP, Linux®, Solaris™ (x86), Netware®, FreeBSD®, VMware® and more. Fastest and safest way for making a. arrived at our warehouse. We are convinced you will. 1pc 9260 Key. About 6-8weeks to other countries. Supports RAID levels 0, 1, 10 (RAID levels 5 and 50 with optional ServeRAID M1000 Series Advanced Feature Key). 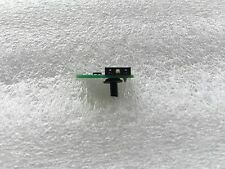 1pc LSI 9220-8I /w Full bracket. Supports SAS and SATA drives. Connects to up to 16 SAS or SATA drives. HP H220 Host Bus Adapter 650933-B21 660088-001. Total Number of SAS Ports: 2. Number of SAS Ports (Internal): 2. Form Factor: Plug-in Card. OS Support Microsoft Windows, Linux (SuSE, Red Hat), Solaris, VMware, FreeBSD See the downloads page for details on versions The HBA supports Solaris 10 and Oracle® provides a built in driver; installation of an LSI driver is not required. 512MB 1333MHz DDRIII SDRAM. Up to 128 SAS and/or SATA devices. Data Transfer Rates. No CD drive. Balance protection and performance for critical applications with RAID levels 0, 1, 10,. Internal Ports. ² 1 X LSI 9264-8i Raid Card BBU08 Battery. We will do our best and help you provide the solution. ETA 3 to 6 Weeks. the item in the picture is everything you will receive. ※ All faulty due to improper installation or improper use will NOT be covered by the warranty. It uses a PCI-E 3.0 connection with x8 lanes. You will need a compatible cable to connect these to your hard drives, SSDs, or a backplane. I have fully tested them using all 8 SAS lanes. They have been cross-flashed to Avago / LSI 9400-8i Tri-Mode IT (Initiator Target) firmware version P9 (specifically 09.00.03.00). Interface: SATA 3GB SAS. 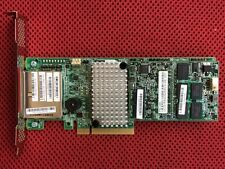 1pc LSI 3081E-R Raid card /w Full bracket. Internal Port(s): 36 Pin Dual Mini SAS. 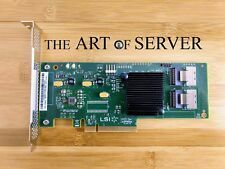 Host Bus: PCIe x8. Board Form Factor: Low Profile MD2 Card. RAID levels 0, 1, 5 and 6. RAID spans 10, 50 and 60. LSISAS2108 RAID-on-Chip (ROC): 800MHz PowerPC. 6Gb/s throughput per port. SAS 9201-16i (HBA). Storage Connectivity ; Data Transfer Rates： 16 ports; 6Gb/s SAS 2.0 compliant. SAS Bandwidth ：Half Duplex. x8, PCIe, 4000 MB/s. PCI Data Burst Transfer Rates ： Half Duplex. PCI Card Type ：3.3 V Add-in Card. Mfr Part Number: LSI00208. 16x internal SATA SAS ports. Device Support: Upto 128 SATA and/or SAS hard drives. Connectors: 4x Mini SAS SFF8087 internal connectors. RAID levels 0, 1, 5 and 6. RAID spans 10, 50 and 60. ² 2 X 8087 to 4 SATA cable. ² 1 X 9270CV-8i raid card. We keep our promises that we will provide you with the best solution within 24 hours. Arrived at our warehouse. We are convinced you will. · Connect up to 128 SATA or SAS drives with eight internal 6Gb/s SATA SAS ports. · Bandwidth to support critical applications with PCIe 3.0 connectivity. · option two top-mounted Mini-SAS SFF8087 SAS connectors. ² 2 X 8087 to 4 SATA cable. ² 1 X LSI 49571-03 Battery. ² 1 X 9270CV-8i raid card. We keep our promises that we will provide you with the best solution within 24 hours. Storage Connectivity ; Data Transfer Rates： 16 ports; 6Gb/s SAS 2.0 compliant. SAS Bandwidth ：Half Duplex. x8, PCIe, 4000 MB/s. 1pc LSI 9201-16I Host Bus adapter Card. PCI Data Burst Transfer Rates ： Half Duplex. ² 1 X LSI 9266-8i Raid Card BBU09 Battery 2 X 8087 to 4 SATA cable. ETA 3 to 5 Weeks. We will do our best and help you provide the solution. ※ All faulty due to improper installation or improper use will NOT be covered by the warranty. I have fully tested them using all 8 SAS lanes connecting both the internal SFF-8087 and external SFF-8088 connectors. I've used ZFS for many years. I'm familiar with ZFS on Linux, FreeNAS, and many of the technologies commonly used by other enthusiasts. CacheVault Flash Module CVFM04. Power Module CVPM02. Flexible SATA SAS array architecture optimizes cost. Eight internal 12Gb/s SATA SAS ports. Low-profile form factor. High performance with 12Gb/s data transfer rates. Two x4 SFF-8643 mini-SAS HD internal connectors. RAID Data Protection Features RAID levels 0, 1, 5 and 6. RAID spans 10, 50 and 60. Online RAID Level Migration (RLM). 64 logical drive support. Check Consistency for background data integrity. SGPIO (sideband). RAID: RAID 0/1/5/6/10/50/60. Transfer Rate: Up to 6Gb/s data transfer rate. We keep our promises that we will provide you with the best solution within 24 hours. Transfer Rate applicable handing fees. the item in the picture is everything you will receive.